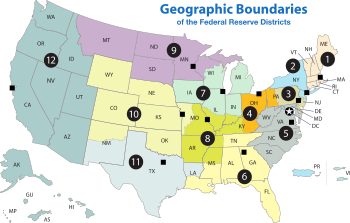 A map of the 12 districts of the United States Federal Reserve system. Once again the economy is beating forecasters, who expected new claims to come in at 230,000. Either way, the performance of the economy continues to astound Democrats increasingly worried about the midterms and delight Republicans who voted for tax cuts and tax reform. The last time new claims were this low was in 1973, when the labor force was much smaller. In 1973, the U.S. labor force was 100 million; today it is more than 160 million. Translation: Unemployment claims are the lowest in U.S. history when compared to the workforce. It gets better. Wages are going up, and not just because of tax cuts enacted under the Trump administration. A single taxpayer earning $50,000 a year is enjoying an extra $50 a week in his paycheck, while a family of four earning the median household income of closer to $60,000 is enjoying an extra $170 a month in their take-home pay. Wages were already rising as employers try to attract new talent in an economy that is cooking along at almost full capacity. Those tax cuts, which began to be felt in January, were being fully enjoyed by workers in February, and the workers are being prudent with them, putting much of their recovered wages into savings and paying down debt. Keynesian economists, who continue to believe that consumers drive the economy (small businesses drive the economy, providing goods and services that customers then purchase), are warning that with the labor market so tight, inflation must be just around the corner. In fact, it is now the announced policy of the Federal Reserve to head off incipient inflation by raising interest rates, even where there is scant evidence for it. The Commerce Department, also reporting on Thursday, said that the PCE Index — the personal-consumption expenditures price index, which the Fed prefers over the more commonly used CPI (Consumer Price Index) — increased just 1.8 percent in February when compared to a year earlier. Back then, the PCE was at 2.2 percent. So where’s the inflation that the Fed is so concerned about? Checking its own statistics, from the St. Louis branch of the Federal Reserve System (see map above), one learns that the money supply has been decreasing, not increasing. The Fed’s “adjusted monetary base” in September 2014 was $4.15 trillion. The latest reading shows it at $3.85 trillion, a shrinkage of $300 billion. Without Fed intervention, the “Goldilocks” economy continues to steam right along. The unemployment rate is at record lows and is expected to move even lower in the coming months. Small business optimism is strong. And then there’s the coming impact of Trump’s tax reform. Although much has been said about the $1,000 bonuses and pay increases that were directly tied to those tax cuts being enjoyed by American companies, little has been said about the tsunami of foreign capital being repatriated and invested in new ventures and the expansion of existing ones. According to the congressional Joint Committee on Taxation, the total profits being held overseas as of August 2015 was $2.6 trillion. If just half of that amount were to be repatriated, taking advantage of the 15-percent “tax holiday” rate, at least two things would happen. First, the U.S. Treasury would enjoy an influx of $200 billion. Second, the remaining $1 trillion (remember, this assumes that for some reason American companies don’t repatriate all of their overseas profits and just bring home half of what’s being held abroad) will quickly find a place in the American economy where it can be put to the highest and best use. That simply means additional stimulus (real capital, not borrowings from the Federal Reserve) to an economy already enjoying breathing again. There will be new capital investment of course: new ventures, expansion of existing factories, shipping and transportation resources, and technology. In addition, much of it will flow out to investors in the form of stock buybacks and increased dividends, rewarding them for their investments. Along with that, however, will be increased paychecks and benefits packages. Parental leaves will be expanded, medical insurance plans will be enhanced, employer contributions to employees’ 401(k) plans will be raised, educational opportunities to make those employees more valuable will be expanded — the list goes on. Much of this will start to be felt in earnest just in time for the midterm elections in November. Republicans are already hanging the millstone around Democrats’ necks that none of them — not one — voted for Trump’s tax-reform bill. Polls are already showing whatever advantage the Democrats might initially have enjoyed in the House races disappearing, negating the historical record that the incumbent party loses congressional seats during midterm elections. The latest from RealClearPolitics shows clearly the gap narrowing in generic polling, with the midterms still seven months away. Bill Clinton was right. He said “It’s the economy, stupid,” as the Democrats themselves could well discover in November. with a free copy of Bob's most popular eBook! Sign up to to receive Bob's explosive articles in your inbox every week, and as a thank you we'll send a copy of his most popular eBook - completely free of charge! How can you help stop the Democrat's latest gun grab? How is the Federal Reserve deceiving America today? What is the latest Obama administration scandal coverup? Sign up for the Light from the Right email newsletter and help stop the progressives' takeover of America! This entry was posted	on Monday, April 2nd, 2018 at 4:51 am	and is filed under Economics, Politics. You can follow any responses to this entry through the RSS 2.0 feed. You can leave a response, or trackback from your own site. Many of the articles on Light from the Right first appeared on either The New American or the McAlvany Intelligence Advisor. Follow Teddy Otero's board Liberty or Death on Pinterest.